Hedge funds and Mutual funds are two popular pooled investment vehicles, wherein a number of investors entrust their money to a fund manager, who invest the same in different kinds of publicly traded securities. A mutual fund is an investment, that offers the investor an opportunity to make an investment in a diversified and professionally managed basket of securities, at comparatively low cost. On the other hand, hedge fund are nothing but unregistered private investments. that uses a diverse range of trading techniques and invest money in securities comprising of diverse risk. The main difference between the two investment avenues is that while mutual fund seeks relative returns, absolute returns are chased by hedge funds. 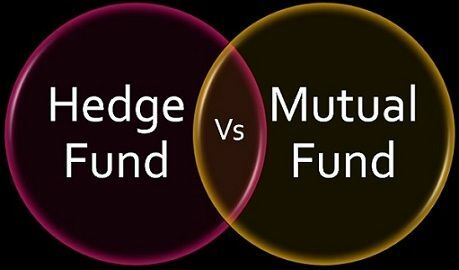 In this article, you can find the important differences between hedge fund and mutual fund, so take a read. Meaning The hedge fund is a portfolio of investments, in which few qualified wealthy investors pool their money to buy assets. A trust, where savings of several investors are pooled together to purchase a diversified basket of securities at low cost, is known as Mutual fund. Management Aggressively managed. Comparatively less aggressively managed. Fees Performance based. Based on the percentage of assets managed. Transparency Information provided to investors only. Annual reports are published and semi-annual disclosure of the performance of assets. A private portfolio of investments that uses advanced investment and risk management strategies to generate good returns is known as Hedge fund. The fund allows only a limited number of accredited investors, who pool their money with the fund manager who invest the money in different types of assets. The fund manager charges a fee for the management of funds, which depends on the profits earned by the assets of the fund. A hedge fund is an investment partnership, where only a few high net worth investors can make an investment in the fund. The minimum amount of initial investment in the fund is relatively high. The fund is set free from strict regulations. The risk factor is very high in hedge funds, that is why the fund manager uses aggressive strategies like selling short, trading option, investing in deeply discounted securities or anticipation of a specific event, etc. However, the fund uses those financial instruments which minimise risk and enhance returns. By the term, mutual fund, we mean an investment vehicle in which a number of investors pool their resources for a common goal established by the fund. The investors collect and pool their money with the fund manager, who use the pool of funds to invest in a diversified basket of securities in the capital market such as stocks, bonds and other tradable goods. The fund manager is a portfolio expert and looks after the effective management and control of the fund. The manager charges a fee for administering the fund, which is based on the value of fund’s assets. The investors to the fund are having an ownership interest in the assets of the mutual fund, where the portion of ownership depends on the funds contributed by each investor. The return on the mutual fund depends on its performance, if the value rises, the return increases and in the reverse case, the return might fall. Net income and the capital appreciation are distributed among the unit holder in the proportion of their capital. A hedge fund is described as a portfolio investment whereby, only a few accredited investors are allowed to pool their money together to buy assets. Mutual funds refer to a professionally managed investment vehicle, where the funds are collected from several investors are pooled together to purchase securities. Hedge funds seek absolute returns. Conversely, mutual funds seek relative returns on the investment made in securities. Hedge funds are aggressively managed, where advanced investment and risk management techniques are used to reap good returns, which is not in the case of mutual funds. The owners of a mutual fund are large in number, i.e. there can be thousands of owners of a mutual fund. However, a hedge fund owners are limited in number. If we talk about the type of investors, hedge fund investors are high net worth investors. On the other hand, a mutual fund has small and retail investors. Hedge funds are lightly regulated whereas mutual funds are strictly regulated by the Securities Exchange Board of India (SEBI). The management fees depend on the percentage of assets managed in mutual funds. As opposed to hedge funds, where the management fees are based on the performance of assets. In hedge funds, the fund manager also holds a substantial part of ownership. Unlike mutual funds where the fund manager does not hold substantial interest. In mutual funds, the reports are published yearly, and disclosure of the performance of assets is made half yearly. As opposed to hedge funds, where the information is provided to investors only, and there is no disclosure of operations publicly. If you are an amateur to the capital market and wants to invest in one of these two funds, then you can make a choice as per your resources. If you have a large amount of money, then you can go for hedge funds, whereas if your investment amount is low then you can opt for mutual funds. Good work. It deserves appreciation.